Nepal is a rich nation in terms of ethnicity and language. People from about 101 ethnic communities call Nepal their home in 90 different languages. Nepali Languages is the Official language of Nepal. All the language spoken within the borders of Nepal are considered national Languages. The founder of the nation, king Prithivi Narayan Shah, declared the nation, as a common garden of people of various creeds. People like different culture of Brahmin, Chhetri, Newar, Rai, Limbu, Mager, Gurung, Sherpa, Chepang, Tamang, Thakali, Yakkha, Bhote, Sunuwar, Damai, Kami, Tharu, Darai, and multitude of other communities live in. Pratap Malla set up a statue of Hanuman ( the Monkey God) there. One can easily be fascinated by the sights of seemingly uncountable monuments at the square, The square constitutes the . Kumari Ghar ( the house of the Living Goddess) and huge idols of Taleju, deguta Krishna, Hanuman ( the Monkey God) and Kal Bhairab made at different tims . Out of the three important palaces of the. Kathmandu Valley, Hanumandhoka palace is given priority. Considered important from different artistic and cultural. as well as the people from other faiths. There are hardly any tourist who doesn't visit the swoyambhunath temple. The Stupa is laden with 13 gold plated spires symbolizing 13 stages to salvation in Buddhha. Different sorts of idols of Buddha has added to the attraction of the Stupa. Pashupatinath Temple Bhaktapur.is revered as one of the most important pilgrimage sites for Hindu devotees all around the world. The temple lies in Gaushala of Kathmandu. According to the Hindu religion. Pashupatinath is considered as the protector of the universe and the patron deity of Nepali people.Hundreds of thousands of Hindu devotees from across the world come to Nepal to visit the temple. While Nepali and Hindu devotees desire to visit the temple for the religious purpose, foreign tourists get attracted toward smal temples and the sculpture of various gods and goddesses within the shrine. 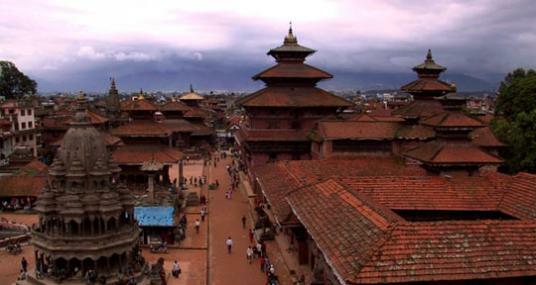 artistic and architectural masterpieces, history and culture of Lalitpur. different times of the history. The existing civilization characterized with Newari life style, and their fabulous traditions and rituals reflected in the day. Day 07: Drive to Chitwan National Park. hosts 570 species of flowering plants, 40 species of mammals, 486 bird species, 17 reptiles and 86 fish species. Day 10: Drive to Lumbini. similarly named place, temple, squares and traditional culture. The Magar and Newar community are dominant in Palpa thus it is possible to closely observe their traditional culture in palpa. Day 16; Drive to Pokhara. added to the Pohkara's beauty. the holy site have become the centre of attraction for followers of one religion alone but all alike, setting an example of religious tolerance. Day 17-18: sightseeing in Pokhara Valley. Daman the Main tourist spot of Makawanpur district, is located on a lofty hilltop and is 75 km from kalanki or 56 km from Hetauda by road. The hill station situated at an altitude of 2322 m is famous among nature lovers. The hill station provides a better view of the Himalayan ranges sunrise and sunset. The panorama of Mountain ranges extending from Mt. Dhaulagiri in the west and Mt Everest in the East. A hilltop view tower has also been constructed here. Day 22: Drive back to Kathmandu.